The majority of the Building Physics Team from the Design Buro attended the UK Passivhaus Conference this year in order to soak up the wealth of knowledge from around the world, in no less than 28 different talks, workshops and discussion panels. Our Head of Building Physics, Dr Sarah Price, delivered a workshop on Quality in Construction at the conference this year, alongside Bill Butcher of the Green Building Store. We asked our team for some of their highlights from the Conference that they would like to share with the wider construction industry. If this isn’t enough, Exeter City Council are also progressing with a £26m Passivhaus leisure centre complete with spa, gym and two pools. This will be only the third Passivhaus swimming pool in the world. The design team and contractor, Sir Robert McAlpine, are working closely with the Passivhaus Institute who are modelling and certifying the leisure centre due to the complexities of the MEP design which will need meet some very rigorous efficiency standards. The Design Buro were bought in to the project to provide some Passivhaus consultancy services to SRM during the contract agreement stages, in order to quantify the risks associated with taking on Passivhaus Certification of such a ground-breaking project. We will also be proving air tightness testing for the project through our specialist services division, Aldas. The near zero energy buildings (nZEB) requirement, which is a European standard, looks likely to continue in Scotland and Wales, possibly also Northern Ireland and probably London and potentially other cities with Mayors. This is likely to be a positive encouragement for Passivhaus, if not necessarily for certificated projects. It seems that if we have one thing to learn from successes in other countries, it is not to be too ‘Passivhaus’. Where the standard has become part of the building regulations, there is always choice for designers and builder so they are not tied to a single certification body. We should focus more on breaking down the Passivhaus criteria, and on the benefits to health, comfort, maintenance, and lifetime costs. We should pay attention to what is happening in the wider global Passivhaus community, for example, the likes of Vancouver who have a similar climate to ourselves are leading the way in Passivhaus builds, and are planning the tallest Passivhaus in the world. A key selling point of the Passivhaus standard is that it creates a comfortable space to work or live in. The session on health and wellbeing in Passivhaus highlighted the importance of the products that we use and specify in our Passivhaus buildings. For example, appliances can create background noise that in a normal building would be hardly noticeable, but in a Passivhaus can become a source of annoyance. There is also a concern around toxic building products that we may be locking it into our habitable spaces leading to toxic building syndrome. 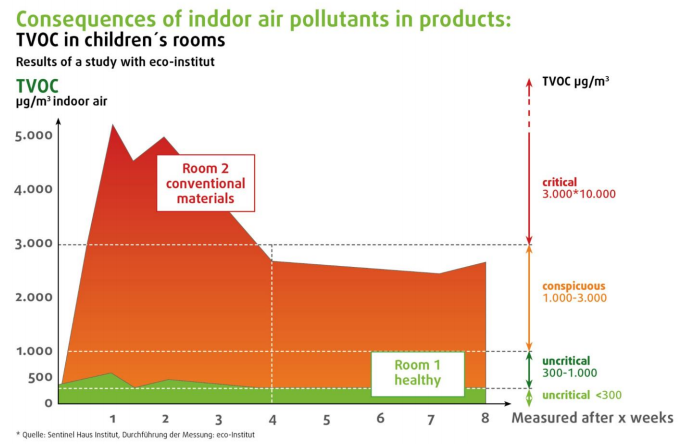 This graph, from a presentation by Thomas Gartner from Gale and Snowden, shows that even after a month the VOCs from paints, furniture and textiles stays at dangerously high levels and it plateaus after a while but never really goes down to a safe level. There was also concern around LEDs and how the quality of light can have a profound effect on the circadian rhythm leading to some chronic sleep disorders and other health problems. CBG Consultants presented the graph above of heating demand for their Passivhaus project ‘Kellogg College Social Hub’, for each stage of the project and after the introduction of different inputs. It shows how sensitive the PHPP is to design changes, and that we must try to be conservative with our modelling at very early design stages. PHPP can be a great tool for options analysis for fabric and mechanical and electrical design, but it requires an experienced user to truly understand the results.